To Busy to be ‘Board’! So today’s ‘thing’ will have to be my cake board adaptation which is necessary for the structure of the cake I’m making…all will become clear tomorrow or Saturday, depending on how long it takes me to decorate it! 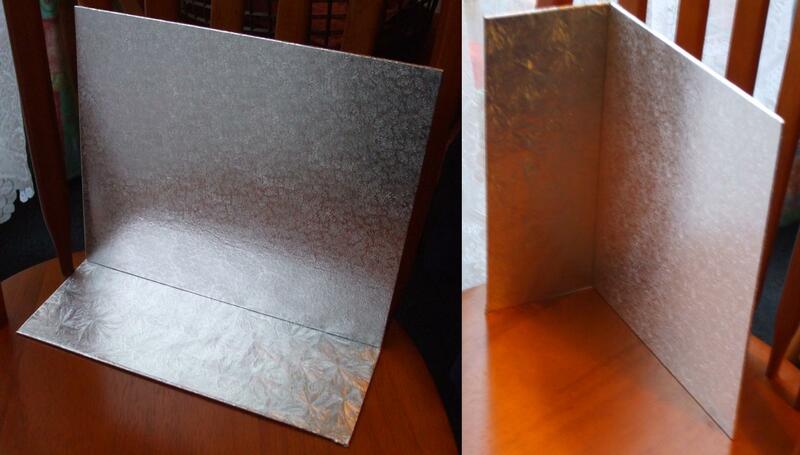 All I have done is cover a piece of cardboard with some silver ‘cakeboard’ paper and ‘hinge’ it to a standard rectangular cakeboard..so that it creates a right angle. It will be used as the photo on the left with the narrower piece at the bottom. Not exactly rocket science! But perfectly designed for its purpose!